Rangthar Trek: Reach a scenic meadow. Enjoy an awesome outdoor experience. The Rangthar trek is one of the easiest trek that we offer and allows you to reach a very scenic point in 2 days only. If you have only a weekend for a visit to the GHNP, Rangthar could be the best option for you. It starts from a village recently connected with the road. 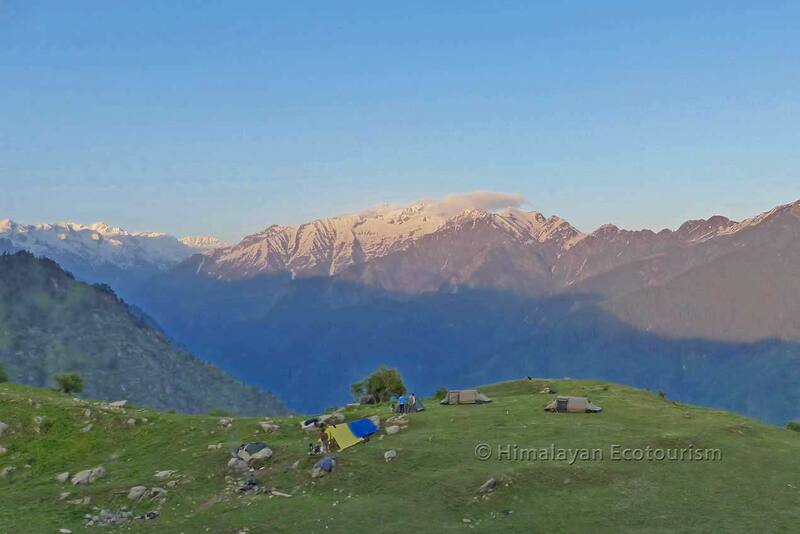 Hence you do not have too much to climb for reaching the campsite at an altitude of about 2900 m above sea level. And what a campsite! 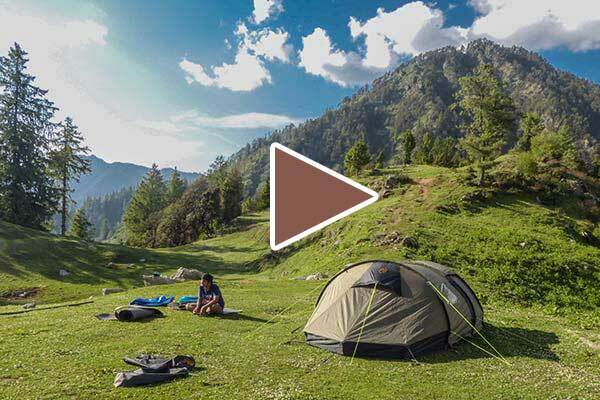 If one dreams of an ideal campsite that blends the rightness of the ground, the beauty of the surrounding environment and the perfect mountains view in the background, Rangthar have them all ! Compared to Rolla, our other 2 days trek, Rangthar requires a bit more of physical effort (ascent of 760 m for Rangthar, 500 m for Rolla) and has no river on the way. 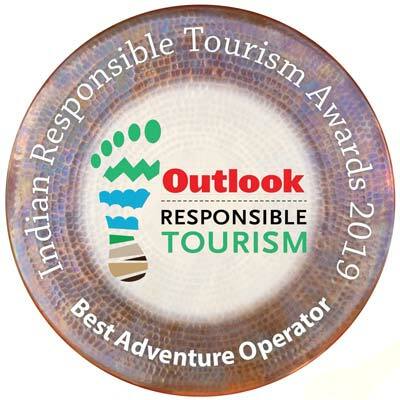 To help you selecting the best 2 day trek we would say that either you prefer a riverside and forested experience with less view of the peaks, then Rolla is yours, or you prefer a great camping experience with a great view of the Himalayas then you should go for Rangthar ! Day-max : The maximum number of days you can spend on this trek. Prolonged itinerary can be discussed with our team. Min : Minimum altitude of your trek. Max : Maximum altitude of your trek. Ascent : The difference of altitude between the trek starting point and the highest point of the trek. Descent : The difference of altitude between the highest point of the trek and the trek ending point. 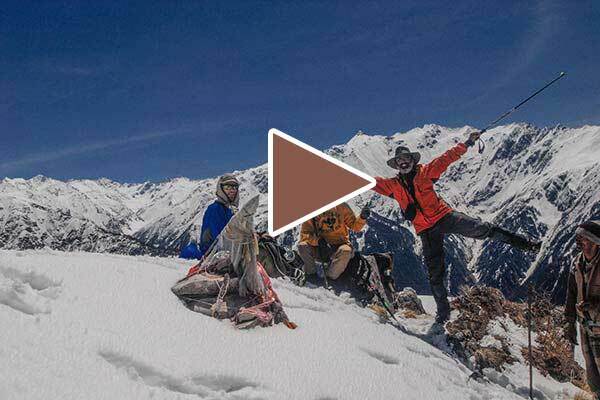 Technical : Difficulty of your trek in terms of exposure to danger and required experience. 80 to 100 : Experience required (please inquire). Overall : Average between Stamina and Technical rating. You need first to hire a jeep (we'll do that for you) to go up to the village Pekhri. You have a regular and comfortable climb up to an abandoned wooden house where you may have your lunch. Then it is a steep half an hour climb to the village Lakcha. From Lakcha you continue on a good trail up to Rangthar. 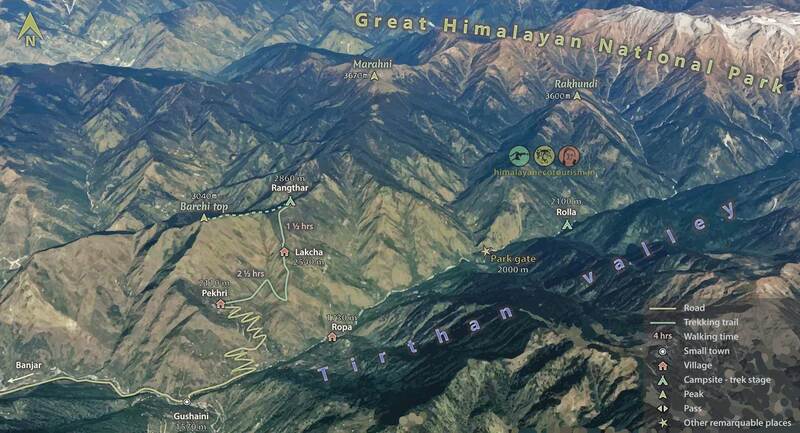 You start at a relatively high altitude (compared to Rolla and Shilt trek). The path climbs on an average slope (nothing difficult though). From Rangthar it is a comfortable slope up to Barchi top. 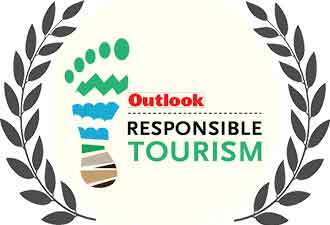 Best time to trek to Rangthar is March, April, May, June, and then October and November. You can also consider July, September and December. The trek starts from the village Pekhri. We will arrange a jeep for you and for the staff to take everyone and the equipment from Gushaini to the village Pekhri. 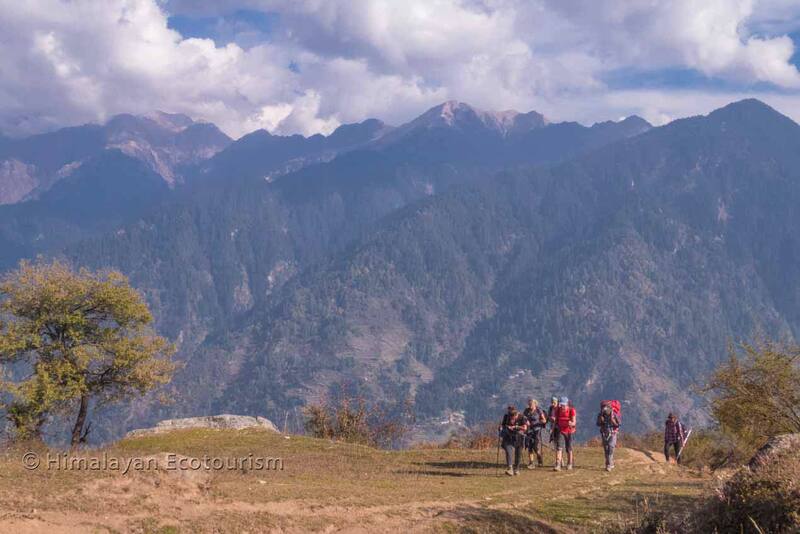 The trek starts with a 5 minutes steep slope to reach the village ground. You leave the village on a nice trail up to a water stream and then continue to the ridge that leads to Lakcha. You can have your lunch before Lakcha. 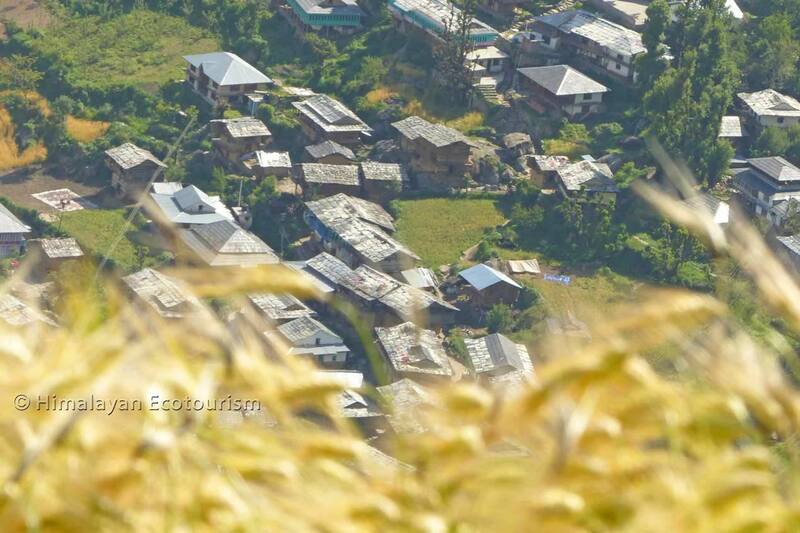 After your lunch continue on a quite steep slope to the village Lakcha. Meet some of the villagers. 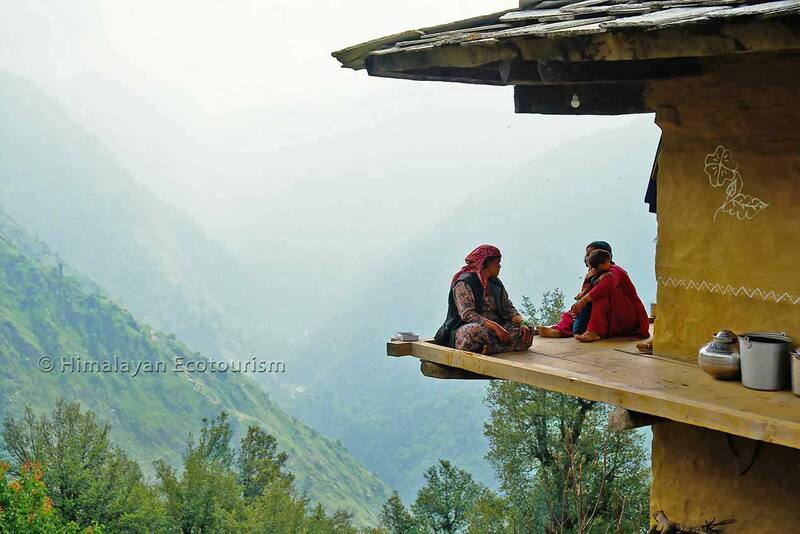 Enjoy the lifestyle of the local people. From Lakcha you have only one hour left to comfortably reach Rangthar crossing a mix landscape of terraced fields and forest. Discover the very pleasant campsite. You can participate in setting up the camp with our staff or just sit with a hot drink that will be available within 15 minutes. 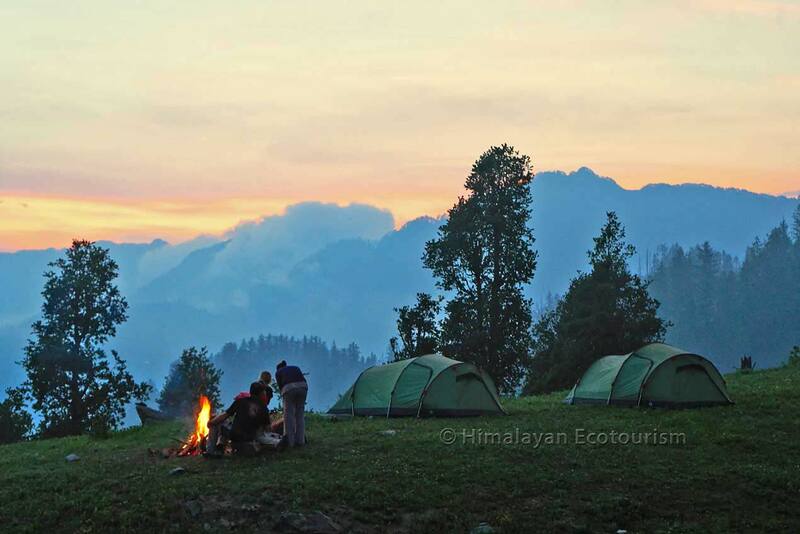 Later you will enjoy the sunset and the campfire before contemplating the stary sky of the Himalayas. Good morning ! Our camping equipment is comfortable, right ? After a copious breakfast everything is packed and you have time to enjoy the place. No hurry you can even have your lunch at Rangthar and go for a fast hike to Barchi top. You go down via the same way to the village Pekhri where the jeep will be waiting for you. This itinerary allows you to easily reach the very scenic Barchi top with a 360 degrees view. Day 1 From Pekhri to Rangthar. Day 2 From Rangthar to Barchi top and return. Day 3 From Rangthar to Pekhri. 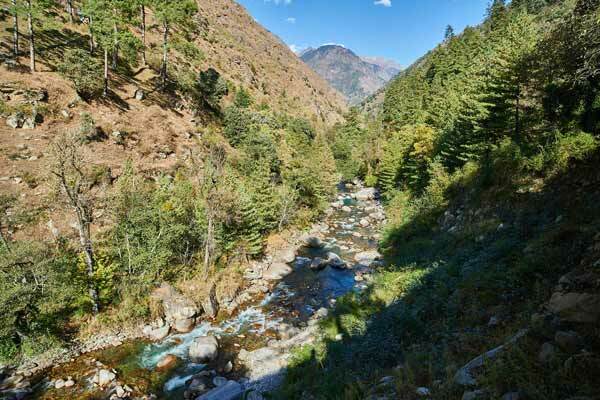 Reaching Kundri involves some steep slopes but takes you in wild Golden Oak forest with great sceneries. More here. Day 2 From Rangthar to Kundri and return. 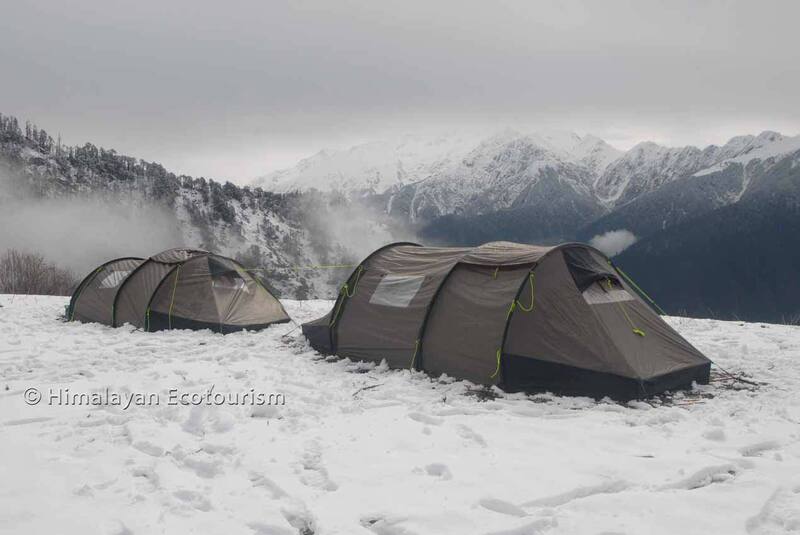 Perfect location, perfect view for a great camping experience. Spend a magical evening around the bonfire, we take care of everything else. The village Lakcha is on the way and offers a unique opportunity to know about the local lifestyle. 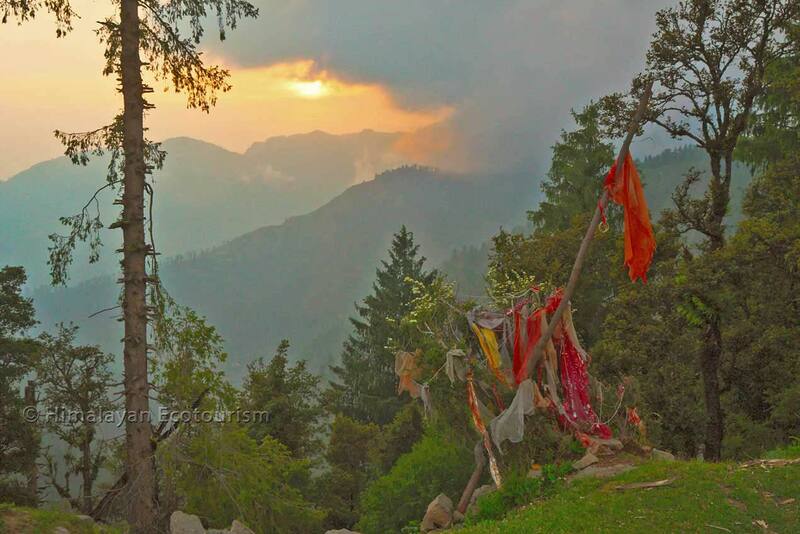 The mountains around you are the cradle of many stories of the Hindu mythology. On that day we woke up with half foot of snow all around ! Just for our pleasure. After Lakcha village, the slope of the trail decreases and makes the hike just good ! 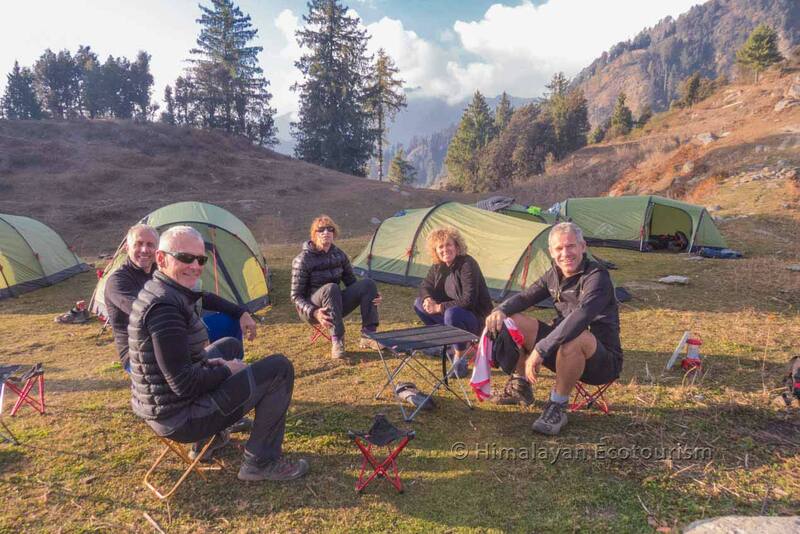 Have you heard about the Himalayan Ecotourism hospitality and quality of equipment ? After half an hour walking you reach this place in the fields above the Pekhri. 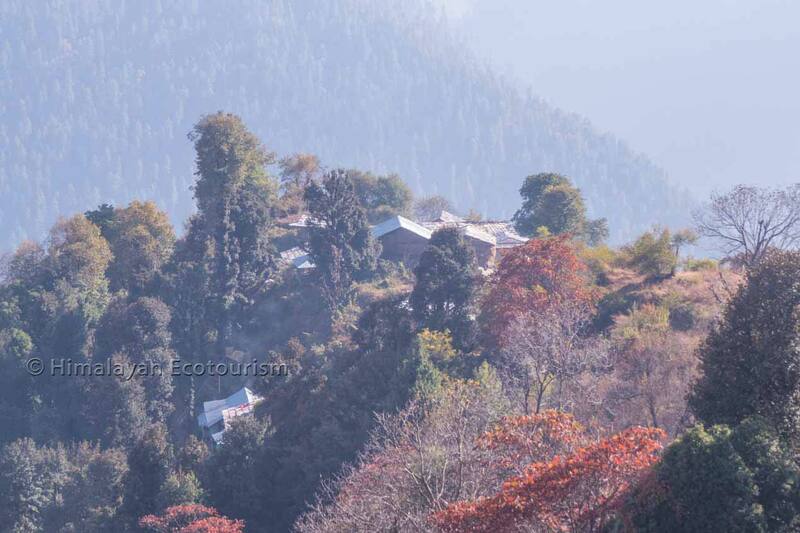 The Lakcha village in autumn is very colourful. 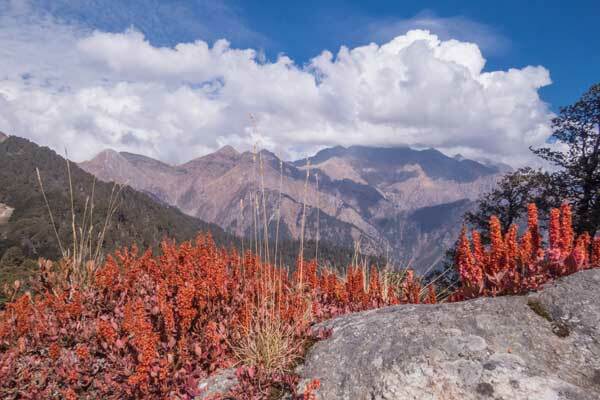 Join and follow us on Social media to get latest updates from the Great Himalayan National Park (GHNP) and the rest of the Western Himalayas.